This post contains affiliate links. If you choose to purchase through these links, a small commission is earned and goes back to support this website! Thank you! 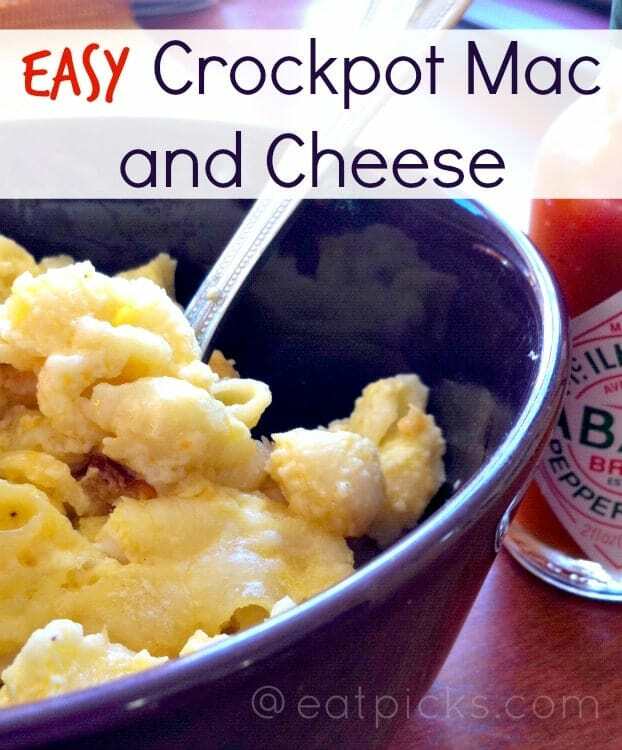 On days where I haven’t had time to get a pot of soup or chili going, I pull this crockpot recipe out of the box. In three short hours, we have a cozy meal ready to go. It’s creamy and fills the belly and soul with warm goodness, almost making me forget the cold, awful weather outside….almost. Grab your cutest apron, mix up a green salad and you are good to go! Cook macaroni according to package directions. Lessen cooking time by 1-2 minutes so pasta is not too soft. While pasta is cooking, prepare rest of recipe. In a saucepan , melt butter then add shredded cheddar. Stir until melted together. Add to crockpot . Stir in soup. Add sour cream. Stir well. Add mustard, salt & pepper (I found 1/2 tsp. was a little much, so I just add a few shakes), milk and eggs. Mix well. Add drained, cooked macaroni and stir well. Cook on low 3 hours. Last 30 minutes of cook time, add a little (1/2 Cup) of shredded cheddar to top. DO NOT STIR. Cover and cook rest of time. Add a few drops of Tabasco sauce for a little kick before digging in, a tossed green salad and you will be good to go! This recipe is adapted from Paula Deen. Cook macaroni according to package directions. Lessen cooking time by 1-2 minutes so pasta is not too soft. While pasta is cooking, prepare rest of recipe. In saucepan, melt butter then add shredded cheddar. Stir until melted together. Add sour cream. Stir well. Add mustard, salt & pepper (I found 1/2 tsp. was a little much, so I just add a few shakes), milk and eggs. Cook on low 3 hours. Last 30 minutes of cook time, add a little (1/2 Cup) of shredded cheddar to top. DO NOT STIR. Cover and cook rest of time.